We invite you to explore India - the Land with infinite beauty ! Whether you soar high into Himalayas or peer under the ruins of the Ancient monuments dotting the landscape of India, you will cherish the experience long after your visit ! This India Travel Guide on Ranthambore National Park is free from any commercial interest! This site is dedicated to promote India - the vast subcontinent, its glorious past, magnificent landscape and its infinite variety. Ranthambore National park of India, famous for Bengal tigers offers an interesting mix of wildlife, history and nature. It has captured the imagination of many wildlife enthusiasts with its diverse wildlife and rich flora and fauna. Located in the Sawai Madhopur district of south-eastern Rajasthan, Ranthambore sprawls over an area of 1334 sq km. Surrounded by lush Aravalli and Vindhya hills; it was once the private hunting ground of the Jaipur kings. The grandeur of architectural pieces and ruins that bound the park stands as testimony to the royal heritage. Tigers are the pride of Ranthambore and they attract more tourists than any other national park in India. Tourists flock to this place to sight the royal tiger in its natural environment. In 1973, Ranthambore forest was brought under 'Project Tiger' to preserve these princely animals. In 1980 Ranthambore was given the status of National park. It is one of the most visited tiger reserves of India and contributes significantly towards Rajasthan revenues. Apart from tigers, one can encounter leopards, sloth beer, marsh crocodile, sambar, chital, Nilgai wild boar, Chinkara, jackals, hyena, peafowl, tree pies, parakeets, robins, painted storks, sandpipers, and plovers. You can find over 300 species of birds. The terrain of Ranthambore switches between thick forests and open lush plains. It has a varying landscape covered by rocky formations, forests, beautiful lakes and streams. The prominent geological feature that gives a distinct identity to the park is the 'Great Boundary Fault' where the Vindhya plateau meets the Aravalli range. Ranthambore forest is a deciduous type of forest with a wide presence of Dhok trees along with other trees like mango, peepal and banyan. Ranthambore national park, with so much to offer can be explored by jeep or canter safari tours organised by both Rajasthan government and other private tour operators. Book the safari in advance as limited vehicles are allowed inside at any given point of time. No private vehicles are permitted inside the park. An expert guide who knows the park terrain and is familiar with the spots that are frequented by the tigers is certainly an added advantage. If you are a serious nature observer, take the private safari as else you might be grouped with other noisy boisterous tourists. Ranthambore fort that lies within the national park is one of the major attractions of Ranthambore. Constructed in 994 A.D.by a Chauhan king, the fort is located on the hill top and offers a historic ambience with huge gates, walls, tanks and temples. The peak of the fort offers a panoramic view of the entire park and the lakes flowing through it. The fort is spread over nearly 7 km. Badal Mahal is part of the northern area of the fort. This 'Palace of the Clouds' has the 84-columnar chhatri used by the King for addressing the crowds. Jogimahal, situated at the foot of the fort, is a forest guest house and lies right next to the Padam Lake. It was once a hunting lodge of the royal dynasty of Jaipur kings. The mammoth Banyan tree inside the Jogimahal needs special mention as it is the second largest of its kind in India. Stroll around the Jogimahal for a few peaceful moments. Rajbagh ruins, situated between the Padam Talao and Rajbagh Talao are full of arches, palace outhouses, broken walls and domes and spiralling steps. Padam Talao, Rajbagh Talao and Malik talao are the three main lakes of the Ranthambore national park. Padam Talao, the largest amongst the three is famous for the lovely lotus flowers; in fact, the lake is named after them. Many wild animals and birds, particularly peacocks can be spotted here quenching their thirst and enjoying the sweet waters of the lake. It is a favourite spot of many professional wildlife photographers. You may even witness fierce encounters between tigers and crocodiles here. Rajbagh Talao, the second largest lake has the Rajbagh ruins dotting it. Watch various animals cooling themselves in the serene waters of the lake. Many a time, the king of the jungle swims across the lake to prey on sambhar deer that come here to feast on floor plants. Malik talao, though the smallest of the three, has plenty of birds and animals flocking it. It particularly attracts huge a bird population including plovers, moorhens, herons, storks, kingfishers, kites and hawks. It is the kingfisher's hunting land for small fish. The Kaila Devi Sanctuary on the northeastern border and Sawai Mansingh Sanctuary on the southern end have been included as part of the Ranthambore National Park.You can find Jogi Mahal at the foothills. This erstwhile hunting lodge of the royal house of Jaipur is a guesthouse for tourists now. Lakarda Anantpura: Located at the northern region of the park, Lakarda Anantapura is home to large number of sloth bears. These animals love the thick vegetation and anthills here. This place also shelters limited number of hyenas. Kachida valley: Kachida valley is located at the north-western borders of Ranthambore and is known for panthers. Other animals seen here are deer and wild boar, and sloth bears and plenty of leopards. Panthers prefer this place over the central region of the forests to avoid conflict with the tigers in that area. Sawai Madhopur is a town that was founded by Madho Singh I of Jaipur. It is famous for a host of temples that dot the area. The Chamatkar Jain temple is dedicated to Lord Adinath and is associated with many miracles. The Jain thirthankaras or 24 Gurus of Jainism can be seen here cast in stone. The Kala Gaura Bhairav temple is a Shiva Temple where tantric rituals are followed. Built in the Nagara style of architecture, the temple has many towers and chattris. It also has a Ganesh temple where people pray before embarking on auspicious events. Enroute the Ranthambore National Park, you can find the Amreshwar Mahadeo temple which is said to be around 1200 years old. It is set amidst scenic natural beauty. Another popular temple here is the Kuwalji temple. Built around the 8th century, this temple dedicated to Lord Shiva. If you visit the Devpura Dam, you are likely to sight Sambar deer, nilgai, spotted dear, hyena and birds of different hues. Around 65 km from Sawai Madhopur is Rameshwar Ghat, at the confluence of the Banas and Chambal rivers. Located on the banks is a Shiva temple and one dedicated to Chaturbhuj Nathji. Pick up attractive bandhani, lahariya and block printed materials here. Silver jewellery and ethnic ornaments here are quite a draw. After having an amazing experience inside the Ranthambore national park, head to the nearby Dastakar centre located 3 km away from the park. This place has attractive handicrafts including saris, scarves, bags and bedspreads on display. Note that all of these items are a handiwork of village woman staying in and around Ranthambore region. Rajasthan is famous for tie-and-die and Batik fabric. These items can be picked up here or at 'Anokhi' or 'Craft house' both located within few kilometres distance from the park. If you are in a mood to carry the images of the royal tiger, Ranthambore School of Art is the place to drop in. This place has a beautiful collection of paintings created by local artists. Most of the paintings are of majestic tigers captured in different moods. Wildlife paintings in the Pichwai tradition by local artists make for good souvenirs. Tigers are always the focus of these paintings. 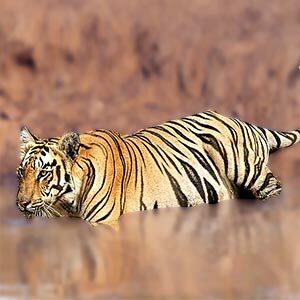 Ranthambore experiences extreme type of climate. Both summers and winters are severe here. The best time to visit the Ranthambore National Pak is November - February or April to May. The park remains open for the visitors from 1st October till 30th June every year. And the park remains closed from 1st July till 30th September. The temple of Lord Ganesh has an annual mela each year in August- September. Sawai Madhopur is the nearest town (about 10 km from Ranthambore) and it is well connected with the all the important cities of Rajasthan by road. Sawai Madhopur is the nearest railway station that falls on the Delhi-Mumbai track and all important trains halt here. Jaipur is the nearest airport which is about 157 km from Ranthambore. From Jaipur, take a taxi or bus to reach to Ranthambore. Safari timing differs according to the season. In summers the timings are: morning safari 6:30 to 9:30 and evening safari16:00 to18:30. Winter safari timings: morning safari 07.30 to 10.30evening safari 15:00 to 17:00. Dress according to the season. Light cotton clothes are just fine for summer where as winters are quite severe here and it is better to wrap yourself with woollens in winter. Do not wear bright coloured clothes or perfume. Do not feed the animals. Wear colours that can camouflage with jungle backdrop. Smoking, flash photography and walking are not permitted inside the park.